Yesterday I ran the Wrightsville Beach Half Marathon. I haven't tackled 13.1 since last year's race, and I was a bit rusty, which wasn't helped by the fact that I'd slacked on my training, as usual. I feel like the last few races I've signed up for have been half-assed attempts. I begin with grand plans, and then other things - graduate school, getting married, writing a novel - get in the way. But, since those things getting in my way are more important to me than a PR, I'm okay with this system. Until, of course, I'm standing at the start of a half marathon, wondering how on earth I'll make it to the finish line. In addition to the thesis ruling my life, my training was also affected this time around by my back issues. I've been going to the chiropractor weekly since November, and while things are much better (I can now walk and run, for example) I still have a mild but persistent ache in my left hip, worse after a run and requiring lots of crescent lunges and pidgeon poses. Still, I was terrified that I would reignite whatever issue had kept me bedridden for ten terrible days last fall, so I trained very conservatively for this race. Two runs a week (sometimes less!). No speedwork. Tons of yoga. And a weekly long run around Greenfield Lake with friends who were also training for the half. We started the first week of January with four miles, and then added a mile each week until we got up to ten. Honestly, if it wasn't for these running friends, I doubt I would have kept up with training at all, and probably would have had to drop out of the race. There is something especially motivating about having people counting on you. Plus we got to gossip while we ran, which is really the best part. That and the big breakfasts after you're done. L: Best friends cheering for us! R: Katie and I zooming by! But I'm getting ahead of myself. So there I was at 6:45 in the morning, standing in the dark with a throng of people, waiting for the race to start. 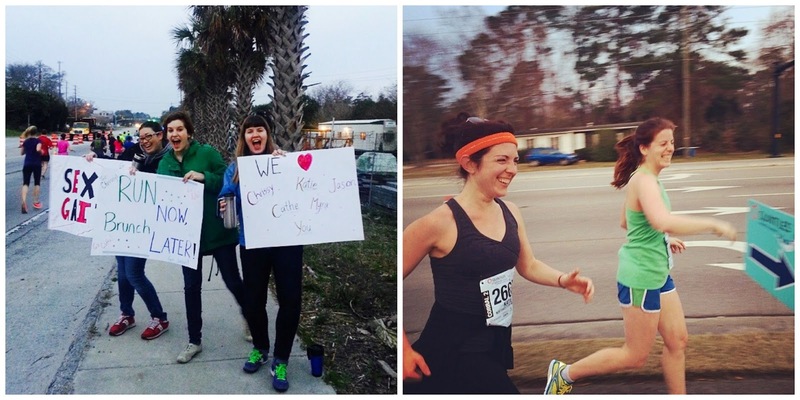 My friend Katie and I decided to start with the two hour pace group and see what happened. The gun went off, we started running, and it felt fast but not altogether too terrible. The sun came up as we crossed the bridges out of Wrightsville Beach, which is my favorite part, and the temperatures were perfect - high 50s and overcast. I felt good. Then we saw our friends Erica, Sally, Katie, and Dory. They'd made signs the night before, then gotten up before dawn to cheer us on. It was so exciting and so motivating to see them at mile 3... and at mile 6... and at mile 11. Each time, their cheers gave Katie and I (who were still running together!) a bust of energy. We couldn't see the pace leader, but I knew from my Garmin that we were going to come in pretty close to two hours anyway. Between our nonstop conversation and our amazing friends, I felt strong and fast almost until the end. I say almost, because shortly after we saw our friends for the last time, Katie and I became very quiet. Conversation ceased and all I could hear was my own labored breathing. At mile 12 I told Katie that I had to pull ahead - I was feeling nauseous and dizzy, and I needed to be done ASAP. Plus I could see that I was so close to a sub-two hour half, and I wanted it, even though I hadn't trained for that kind of race and didn't deserve that time. I started running faster, I passed people, I rounded a long corner, then another long corner, and then the finish line was in sight. I crossed it, grabbed my medal and a water, and weaved around the finishers chute until I saw Katie come in about a minute later. We high fived and then we found a port-a-potty, because a runner's life is glamorous indeed. 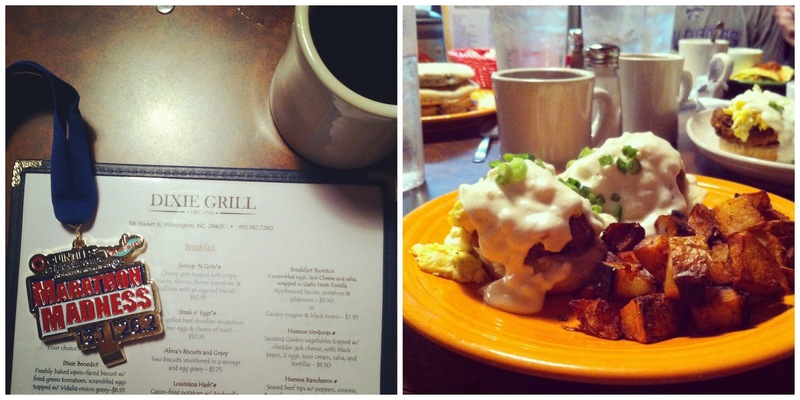 After we'd all finished the race, we headed straight to The Dixie Grill for huge plates of Dixie benedicts - a biscuit, topped with scrambled eggs, fried green tomato, and vidalia gravy. Also hashbrowns. And blueberry pancakes for the table to share. And coffee, coffee, coffee. It was amazing, and made all 13.1 miles well worth the effort. As for that sub two hour half I was hoping to capture? Not quite, but really, really close. It makes me wonder, as always, how well I could do if I trained consistently and really pushed myself. Maybe in November. My Sunday running group is already eyeing a half in the Outer Banks, a few hours north of us - a sure sign that we had a great time and a fantastic race.